A new analysis of the extinction of woolly mammoths and other large mammals more than 10,000 years ago suggests that they may have fallen victim to the same type of "trophic cascade" of ecosystem disruption that scientists say is being caused today by the global decline of predators such as wolves, cougars, and sharks. In each case the cascading events were originally begun by human disruption of ecosystems, a new study concludes, but around 15,000 years ago the problem was not the loss of a key predator, but the addition of one – human hunters with spears. In a study published in the journal BioScience, researchers propose that this mass extinction was caused by newly-arrived humans tipping the balance of power and competing with major predators such as saber-toothed cats. An equilibrium that had survived for thousands of years was disrupted, possibly explaining the loss of two-thirds of North America's large mammals during this period. "For decades, scientists have been debating the causes of this mass extinction, and the two theories with the most support are hunting pressures from the arrival of humans, and climate change," said William Ripple, a professor of forest ecosystems and society at Oregon State University, and an expert on the ecosystem alterations that scientists are increasingly finding when predators are added or removed. "We believe humans indeed may have been a factor, but not as most current theory suggests, simply by hunting animals to extinction," Ripple said. "Rather, we think humans provided competition for other predators that still did the bulk of the killing. But we were the triggering mechanism that disrupted the ecosystem." In the late Pleistocene, researchers say, major predators dominated North America in an uneasy stability with a wide range of mammals: mammoths, mastodons, ground sloths, camels, horses, and several species of bison. The new study cites previous evidence from carnivore tooth wear and fracture, growth rates of prey, and other factors that suggest that there were no serious shortages of food caused by environmental change 10,000 to 15,000 years ago. Quite contrary to that, the large herbivores seemed to be growing quickly and just as quickly had their numbers reduced by a range of significant carnivorous predators, not the least of which was lions, dire wolves, and two species of saber-toothed cats. Food was plentiful for herbivores, the system was balanced, but it was dominated by predators. "When human hunters arrived on the scene, they provided new competition with these carnivores for the same prey," said Blaire Van Valkenburgh, an expert at UCLA on the paleobiology of carnivores, and a co-author with Ripple on this study. "The humans were also omnivores, and could live on plant foods if necessary," Van Valkenburgh said. "We think this may have triggered a sequential collapse not only in the large herbivores but ultimately their predators as well. Importantly, humans had some other defenses against predation, such as fire, weapons and living in groups, so they were able to survive." But the driving force in eliminating the large mammals, according to the new theory, was not humans – they just got the process started. After that, predators increasingly desperate for food may have driven their prey to extinction over long periods of time – and then eventually died out themselves. In recent studies in Yellowstone National Park and elsewhere, scientists from OSU and other institutions have explored these "trophic cascades," often caused by the loss or introduction of a single major predator in an ecosystem. With the elimination of wolves from Yellowstone, for instance, the numbers of elk exploded. This caused widespread overgrazing; damage to stream ecosystems; the slow demise of aspen forests; and ultimate effects on everything from trees to beaver, fish, birds, and other life forms. When wolves were re-introduced to Yellowstone, studies are showing that those processes have begun to reverse themselves. "We think the evidence shows that major ecosystem disruptions, resulting in these domino effects, can be caused either by subtracting or adding a major predator," Ripple said. "In the case of the woolly mammoths and saber-toothed tiger, the problems may have begun by adding a predator, in this case humans." The new analysis draws on many other existing studies in making its case. For instance, other research describes this process with a model in modern times in Alaska. There, the allowance of relatively limited human hunting on moose caused wolves to switch some of their predation to sheep, ultimately resulting in a precipitous decline in populations not only of moose but also wolves and sheep. 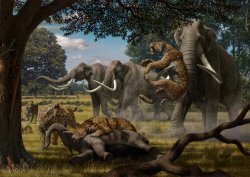 The loss of species in North America during the late Pleistocene was remarkable – about 80 percent of 51 large herbivore species went extinct, along with more than 60 percent of important large carnivores. Previous research has documented the growth rates of North American mammoths by studying their tusks, revealing no evidence of reduced growth caused by inadequate food – thus offering no support for climate-induced habitat decline. It seems that diverse and abundant carnivores kept herbivore numbers below levels where food becomes limiting. By contrast, the large population of predators such as dire wolves and saber tooth cats caused them to compete intensely for food, as evidenced by heavy tooth wear. "Heavily worn and fractured teeth are a result of bone consumption, something most carnivores avoid unless prey is difficult to acquire," says Van Valkenburgh. Trophic cascades initiated by humans are broadly demonstrated, the researchers report. In North America, it may have started with the arrival of the first humans, but continues today with the extirpation of wolves, cougars and other predators around the world. The hunting of whales in the last century may have led to predatory killer whales turning their attention to other prey such as seals and sea otters - and the declines in sea otter populations has led to an explosion of sea urchins and collapse of kelp forest ecosystems. "In the terrestrial realm, it is important that we have a better understanding of how Pleistocene ecosystems were structured as we proceed in maintaining and restoring today's ecosystems," the researchers wrote in their conclusion. "In the aquatic realm, the Earth's oceans are the last frontier for megafaunal species declines and extinctions." "The tragic cascade of species declines due to human harvesting of marine megafauna happening now may be a repeat of the cascade that occurred with the onset of human harvesting of terrestrial megafauna more than 10,000 years ago. This is a sobering thought, but it is not too late to alter our course this time around in the interest of sustaining Earth's ecosystems."